Burnley appear to have a genuine interest in signing Lille striker Nicolas de Preville this summer. According to the football transfer rumours in British Media (Daily Mail), Burnley have submited bid for Lille striker Nicolas de Preville. The France international has joined Lille from KV Oostende in August 2016. Since his arrival from KV Oostende, Nicolas de Preville has scored 15 goals and provided one assist in 34 games for Lille in all competitions last season. The France international has been in impressive form for Lille last season. Nicolas de Preville has represented France at Under-20 level, winning 5 caps and scoring 3 goals. 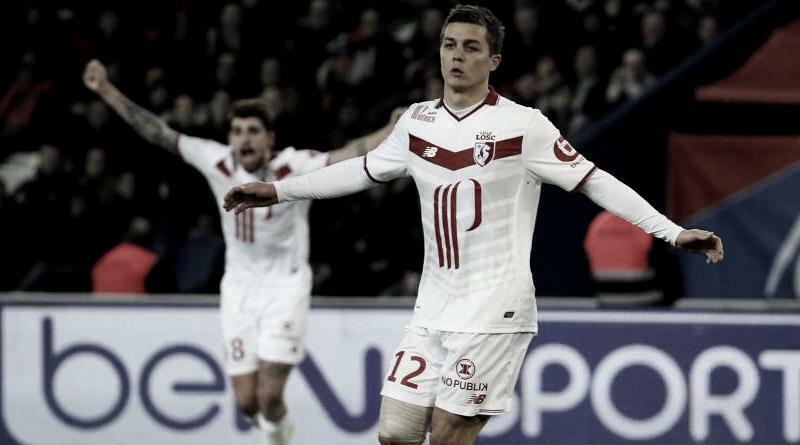 The France international is high in demand this summer, with him having enjoyed a sublime season for Lille last term. Adding a striker remains Burnley’s top priority this summer and Sean Dyche will have drafted a shortlist of a number of possible targets he could approach in the coming days. Sean Dyche is a long term admirer of Nicolas de Preville and believes he can get the most out of the France international. He will reportedly be handed a huge transfer kitty this summer and the Lille striker is thought to be among the manager’s priorities. According to the report in British Media, Burnley have launched a 14 million euros move for Lille striker Nicolas de Preville.